Researchers at the Center for Cognition and Sociality, within the Institute for Basic Science (IBS), have just published as study in Neuron reporting a genetic variant that controls and increases empathy-driven fear in mice. As empathy is evolutionarily conserved from rodents to humans, this finding might clarify individual variability in neuropsychiatric conditions characterized by empathic impairment, such as autism, psychopathy and schizophrenia. Empathy is the capacity to understand and share another's emotions. However, since empathy is a complex social phenomenon, its genetic and neurological roots are not easy to explain. Recently, it was discovered that empathy is similar between rodents and humans. Rats and mice possess a remarkable affective sensitivity to the emotional state of their peers; they are distressed by others' pain and show consolation behavior. 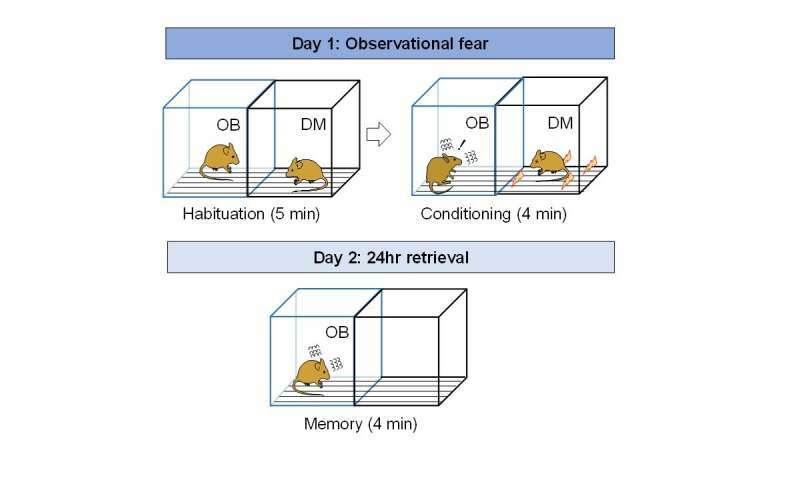 For this study, the researchers analyzed the empathic behavior of mice toward fear. "Fear is a key instinct, as predicting danger is key to survival. It is not acquired only by directly experiencing a dangerous event, but also by observing others in threatening circumstances," explains KEUM Sehoon, the first author of the study. IBS scientists used observational fear tests in which mice observe other mice receiving a mild electric shock to their feet, and behave as if they received the shock themselves. It is believed that this demonstration of observational fear in rodents could match some characteristics of affective empathy in humans. In this study, the research team compared 18 strains of mice commonly used in laboratories, and found they had different responses in the observational fear test. In particular, one strain (129S1) was significantly more empathic than the others. After sequencing their genomes, the scientists were able to pinpoint to a gene variant of neurexin 3 (Nrxn3)—a protein that connects neurons, evolutionary conserved among vertebrates, and abundant in the cortex of the brain. Moreover, when the scientists artificially introduced the variant in mice with a normal level of empathic fear, the rodents' behavior in the test changed noticeably as they became more empathic. The researchers noted that specific neurons in a region of the cerebral cortex, known as anterior cingulate cortex (ACC), played a key role in the observational fear. The ACC has already been implicated in fundamental cognitive processes, including affective emotion, social cognition, and empathic response of pain and fear in mice and humans. The gene variation affects the somatostatin (SST+) type inhibitory neurons of the ACC. The cortex is known to process complex signals coming from various regions of the brain via excitatory and inhibitory neurons. The SST+ neurons reduce the activity of neighboring neurons, called pyramidal cells, by releasing the inhibitory neurotransmitter (GABA). 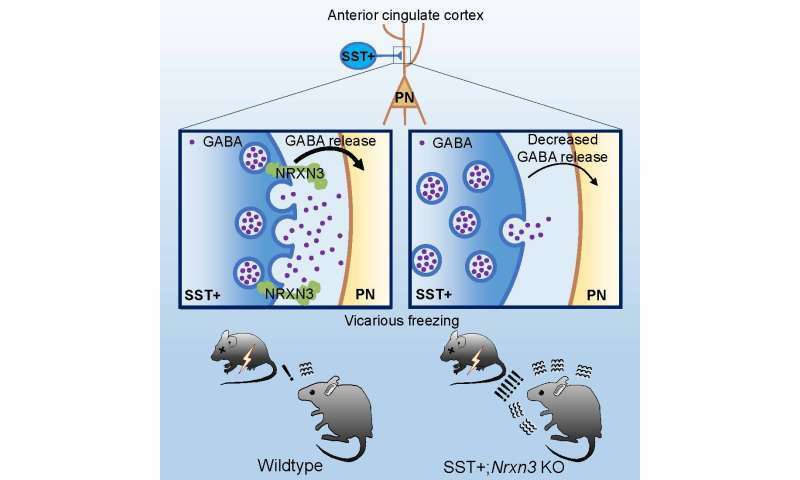 Nrxn3 has distinct functions in different parts of the brain, and this is the first study to identify its role in the SST+ neurons in the ACC in controlling rodents' social behavior. The scientists showed that Nrxn3 is required for ACC's SST+ neurons to accomplish their inhibitory function. When the gene is removed, SST+ neurons released less GABA to the neighboring pyramidal neurons, causing elevated observational fear response. "This is the first report identifying a gene variant and associated neurophysiological mechanisms that control empathy-related neural circuits at a cellular and molecular level," explains Keum. "Studying genetic determinants of empathy will hopefully provide novel targets for therapeutic intervention in mental disorders." The team wants to clarify how activities of SST+ neurons in the ACC are functionally associated with different degrees of observational fear, and whether Nrxn3-dependent SST+ neurons control other types of empathy-related behaviors, such as emotional contagion of pain, consolation, or prosocial helping behaviors.